My question is...If I enable the option to have both WiFi and Mobile Data on together, will my Samsung Note 5 pull data from the mobile data while it is connected to the WiFi or will it simply keep both on and only use Mobile Data when the WiFi either becomes weak or disconnected. The reason I ask, is that, if I can safely have both WiFi and Mobile Data active at the same time, it would be a big help to some of my more finicky app (like the JET Mobile app I use for my part time job) from hanging and crashing. Any information or clarification you all could provide would be greatly appreciated. It does what each option says in its description. Try it out. If I have WiFi Data and Mobile Data turned on at the same time...Will my Note 5 Smartphone pull data from the WiFi Data Connection or the Mobile Data Connection or will it pull data from both at the same time? For example, if I have both WiFi Data and Mobile Data turned on at the same time, and I send an email to a friend...will my Note 5 Smartphone use the WiFi Connection to send the email or will my Note 5 Smartphone use the Mobile Data Connection to send the email? What I am hoping is that if I have both WiFi Data and Mobile Data turned on, that the Note 5 will use the WiFi Connection until it becomes unstable and it will then seemlessly switch over to Mobile Data. But I personally have no way of knowing since I don't have enough technical knowledge to be able to accurately read signal data. If anyone knows the answer, it would be great. 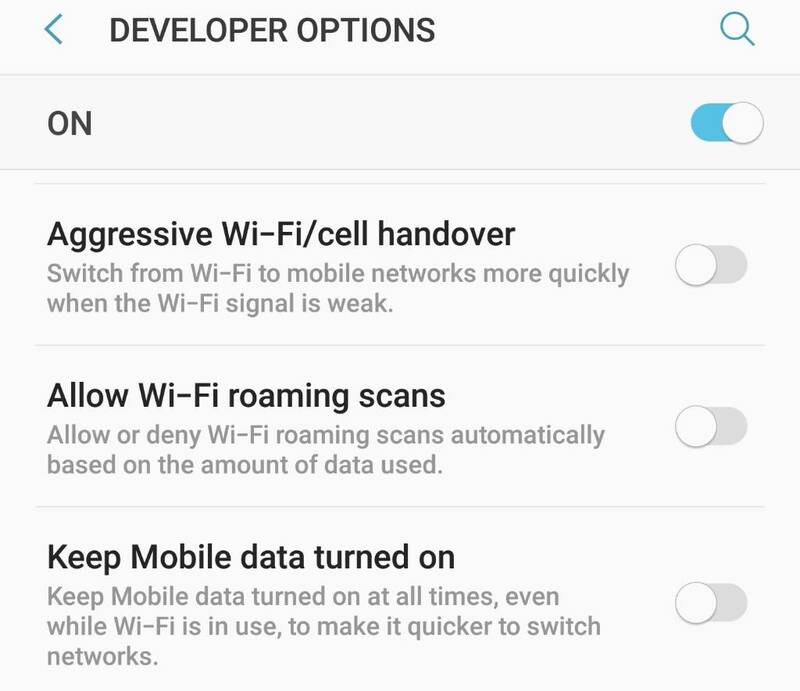 Option 1 and 3 say you'd be using Wi-Fi unless it needed to additionally use cell data. You can verify this by going into Settings, data usage. If you're on a website (or an app that accesses a website under the hood), you're identified by your IP connection, so when it switches to mobile data you might lose the connection (because your IP address is different for each connection) to the site until you log in again. It only takes a second, but it can throw you if you're not prepared for it. So what I think that I am going to do is turn on the WiF & Mobile Data option and see how it goes for a while, and if it goes well, I will leave it on and if not I will shut it off. I might also experiment with the Agressive Handover option just to see how it works with my usage. I'll try to remember to report back to you all. Why do I have com.vzw.apnlib on my phone when I don't have Verizon as a carrier? Why won’t play store open on my Polaroid TV? Wifi disabled on not just 1 but 2 phones same time.? An changing location fixed it?